We’d love your help. Let us know what’s wrong with this preview of When Half Is Whole by Stephen Murphy-Shigematsu. "I listen and gather people's stories. Then I write with the hope to communicate something to people, that they gain something of value by reading these stories. I tell myself that this is something that isn't going to be done unless I do it, just because of who I am. It's a way of making my mark, to leave something behind—not that I'm planning on going anywhere, right now "I listen and gather people's stories. Then I write with the hope to communicate something to people, that they gain something of value by reading these stories. I tell myself that this is something that isn't going to be done unless I do it, just because of who I am. It's a way of making my mark, to leave something behind—not that I'm planning on going anywhere, right now." So begins Stephen Murphy-Shigematsu in this touching, introspective, and insightful exploration of mixed race Asian American experiences. The son of an Irish American father and Japanese mother, Murphy-Shigematsu has devoted his life to understanding himself as a product of his diverse roots. Across twelve chapters, his reflections are interspersed among profiles of others of biracial and mixed ethnicity and accounts of their journeys to answer a seemingly simple question: Who am I? Here we meet Margo, the daughter of a Japanese woman and a black American serviceman, who found how others viewed and treated her, both in Japan and the United States, in conflict with her evolving understanding of herself. Born in Australia and raised in San Francisco, Wei Ming struggled with making sense of her Chinese and American heritage, which was further complicated when she began to realize she was bisexual. Rudy, the son of Mexican and Filipino parents, is a former gang member and hip hop artist who redirected his passion for performance into his current career as a professor of Asian Pacific American Studies. Other chapters address issues such as mixed race invisibility, being a transracial adoptee, hapa identity, beauty culture and authenticity testing, and more. To ask other readers questions about When Half Is Whole, please sign up. Puerto Rican, Chinese, African American. Afro-Chino. Mestiza. A not-so-serious Catholic. Who am I? This whole book is Stephen Murphy-Shigematsu and a load of other similar writers who struggled with this one question, "Who am I, exactly?" The author is Japanese and Irish, sometimes he calls himself the "Celtic Samurai." He was born in Japan and lived in the U.S. and then went back to Japan as an adult. Everybody in this book talks about their life experiences as a mixed race East Asian person. The author struggled with growing up in two worlds where he is not accepted fully. In Japan, he's a foreigner that speaks Japanese, in the United States, he's a Japanese that looks somewhat White, but is still not accepted because he isn't "White enough." Then there's a Mexipino, a Blackinawan, a Jewish Korean adoptee, and a many others who feel foreign wherever they go. This book covers a lot of history about post-World War II Japan and Okinawa that I highly suggest people should read, it really opened up my mind and cleared up a lot of the skewed perceptions people have about other countries. A lot of people don't want to see both sides when people hear about xenophobia. The perspectives I can relate to the most was the Mexipino, Rudy, and the Blackinawin, Mitzi. Rudy's was close because I'm Puerto Rican, I don't speak Spanish and I can't dance, in this case it's salsa, to save my life and I am too timid to do so. So of course, right away, I know that I don't fit in with most Puerto Ricans. Despite that Mexican and Puerto Rican cultures are different, they do share similarities, like how Japanese and Chinese culture share some similarities but they are all different, and they are vastly different from Filipino culture. Mitzi's story relates to me because like most African Americans, I struggled a lot with the "bad hair" complex, and both of us are not visibly Asian looking, knowing that colorism and anti-Blackness is so prevalent in Asian communities. We constantly have to prove who we are. Being Black, but also Asian and Latinx at the same time means receiving Asian microaggressions despite not being full Asian, getting yelled at for speaking Spanish like a gringo and for actually not knowing Spanish at all, and feeling awkward because I literally do not know most of what it's popular in Black pop culture. It also doesn't help that my first and last name is Chinese and for some reason I'm constantly mistaken as Filipino. This is what this book is all about, healing, accepting, and exploring one's self. - Too many books about mixed race Asian experiences focus too much on East Asians, especially Japan. I know that since the author is half Japanese, he will automatically gravitate toward everyone who is Japanese. But in general, there is little representation of mixed-race Asians who aren't East Asian and are non-White. Afro-Asians are always the least represented. What about Latinx Japanese people? What about Afro-Arabs? What about Arab Chinese? What about Afro-Vietnamese or Afro-Indians? - Possibly by pure coincidence and because of the generation the writers were born in, too many books about mixed race Asians have military parents. Not all of us have parents from the military or are military kids. My Singaporean Chinese father was a chef and my mother is a teacher. I am aware that most are from the military, but not ALL of us are. - There needs to be more from those who are American born. A lot of these essays tend to be from people who were born on their native lands and moved here or elsewhere. (Does this make sense what I'm saying?) I read this point over and realized how underdeveloped and silly it sounded. Thank you Melanie Page, for bringing up a good point. One of the people Murphy-Shigematsu covered was a woman, I can't recall her name at the moment, who is a second or third generation Japanese American. Of course, I mean I want stories that are not only U.S. centric. I meant that I wanted to hear more stories about people like the woman I just mentioned, who were disconnected with their culture over the generations, and decided to reconnect. But I also want to hear about the diasporas that take place in other countries like let's say Ireland or somebody like how Kazuo Ishiguro who is Japanese, not mixed race or mixed ethnicity, but lives as a British Japanese who is British all the way through. But since the author is American, of course, he will have more American experiences. P.S. Some people misinterpreted the title of this book and thought that it was about mixed race Asians identifying as Full Asian. No, he's saying that mixed race Asians are becoming whole, becoming whole as in accepting both sides. Not just the Asian side, not just the other side. What he means is taking all of you and becoming whole. No fractions. As soon as I saw When Half is Whole on the Asian Lit Bingo list of possible reads for the non-fiction slot, I knew that I needed to read it. I'm multiracial, and even though the novel examined the experiences of Asian Americans, I thought I might find some things that I can relate to. This is an #ownvoices book. I was mislead by the blurb and thought that this book would discuss experiences of Asian American from a variety of e Check out my book blog for more book reviews and other bookish posts! I was mislead by the blurb and thought that this book would discuss experiences of Asian American from a variety of ethnicities. However, most of the people interviewed had some connection to Japan or East Asia. There weren't many with connections to other parts of Asia, and I was not expecting this at all. Thus, I was quite disappointed here. Also most of the people had some kind of connection to the military, and they were all of the same age, i.e. at least a generation older than me. I thought that this would be a book that would provide a more general overview of Asian American experiences, however the author was focussed on discussing his personal story and most of the experiences of others that he discusses, he analyses them in respect to his own experiences. Thus, I assume, the choices for the people represented fell on the people who were mentioned in this book. This doesn't mean that the book wasn't fascinating, I'd just like the blurb to be rewritten because it certainly made my reading experience less fun as I kept waiting for a more diverse discussion with portraits of people with connections to more place in Asia, and people of different generations. It's an intersectional book, not only discussing racial issues but also talking about sexuality. Sometimes, a person focusses on only one aspect of oppression and doesn't delve into how this intersects with other types of discrimination. He discusses how his viewpoint on LGBTQIAP+ rights changed throughout the years, and I loved this. The author also touched on racism in the Asian American community, and I think this is an aspect that Asian (diaspora) people in general have to keep in mind. We cannot complain about racism happening to us, but do it to others at the same time. 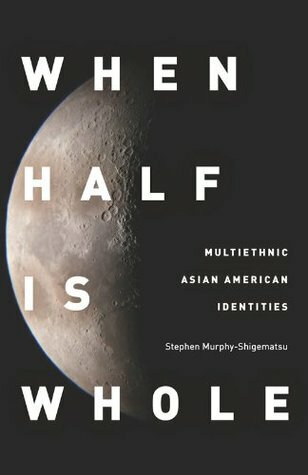 The word "hapa" as a synonym for multiracial Asian Americans is used in this book, and in a later chapter, there is a discussion on whether this term should be used by Asian Americans or if it's appropriation. I'm not Native Hawaiian. If you are and would like to weigh in on how this part was handled, you can comment down below or link your review. The word "Indian" is used in this book, instead of Native American at one point. "While others may see me as "half", I know that I am whole. This whole me is greater than the sum of its parts and connects me to something beyond my self, to communities of others and to a collective self." "Some feel they have the best of both worlds, while others struggle with an ambiguous identity." "When we disobeyed my mother's rules or screamed, we were being ""too American"." "I stifle my curiosity about someone's background and wait to see whether the person decides to tell me or not." So while I liked this book, I was not satisfied as the blurb promises a wholly different book. However, I was able to identify with quite a few experiences and found that I'm not alone in my confusion. It's an interesting book that will introduce you to some experiences that people from more than one culture have, if you yourself are only of one culture. If you yourself, are multicultural, then you might find some concepts familiar. Through the exploration of Asian American identities, Stephen Murphy-Shigematsu touches on universal themes of fitting in and identity. Murphy-Shigematsu is a compelling story teller. This is a must read. This book collects the stories of how different people have struggled to define/accept/understand their identity between multiple cultures by way of relating personal stories and anecdotes. Overall, I found the book insightful; it has given me some things to consider for my own 3-nation family. It is on the scholarly side, so some sections can be a bit dry. Personally, my favorite chapters were 7-11, so if there is any doubt I encourage you to push through to the end. That said, I have 2 minor iss This book collects the stories of how different people have struggled to define/accept/understand their identity between multiple cultures by way of relating personal stories and anecdotes. Overall, I found the book insightful; it has given me some things to consider for my own 3-nation family. That said, I have 2 minor issues with the book that prevented me from fully enjoying the read: one structural and the other dealing with sampling. Structurally, Stephen Murphy-Shigematsu approaches each chapter from his prospective. He is telling us a story, about a person telling him a story to illustrate a point. Since he jumps back and forth between the perspectives it can get confusing to keep things straight. I understand the need to provide context and a framing in his narrative, but the structure makes many chapters more complicated than if it were just told from one perspective throughout. This is a scholarly exploration of several different individuals and groups of half-Asian descent. Being half Japanese and half Irish, I particularly wanted to read this because I've never read any kind of scholarly work on my particular racial/ethnic composition. The author covers those of white and Asian descent, Asian and black, Asian and Latino, adopted Asians, and the abandoned half Japanese, half American children of Okinawa and their particular situation. All of the individuals mentioned This is a scholarly exploration of several different individuals and groups of half-Asian descent. Being half Japanese and half Irish, I particularly wanted to read this because I've never read any kind of scholarly work on my particular racial/ethnic composition. The author covers those of white and Asian descent, Asian and black, Asian and Latino, adopted Asians, and the abandoned half Japanese, half American children of Okinawa and their particular situation. "This is a question of power....Native Hawaiians, in addition to all of the other ways that their sovereignty has been abrogated, lost for many years the right to their own language through oppressive English-language education....Given this history and given the contemporary social and political reality (and realty--as in real estate) of Hawaiian, the appropriation of this one word has a significance deeper than many Asian Americans are willing to recognize...A word used to give power to one community, while taking power away from another is not a word I can use in good conscience" (Wei Ming, as quoted in the essay "Bi Bi Girl," p. 92). In depth look at people who are "half" (part Asian and part something else). In this book, it is mostly Japanese and American that is discussed. It especially looks at Okinawa and its Amerasian kids.